"Let every instrument be tuned for praise! Let all rejoice who have a voice to raise! And may God give us faith to sing always, Alleluia!" Every Sunday morning at 10:45 (10 summer schedule) music is an integral and important part of worship at St. Dunstan’s. Music supports every aspect of the liturgy; music can expand, emphasize, and illuminate the various liturgical themes and actions. For example, the first hymn that we sing at Holy Eucharist is almost always a hymn that praises God and establishes God as the ONE before whom we stand and on whom we depend. Other hymns and anthems provide opportunities for other kinds of prayer. With the aid of hymn and anthem texts, music helps us pray for others and for ourselves. Hymns and anthems also help to tell the Gospel story; our hymnal is arranged to make it clear how that story unfolds – Advent, Christmas, Epiphany, etc. Please come and see–and hear–for yourself. And better yet, consider joining the wonderful individuals who give their time and talents to make music at St. Dunstan’s a reality. Our wonderful parish choir leads us in singing hymns, psalms, and service music, as well as singing an anthem each week. Our 18 member choir is all volunteers, and includes youth and adults. St. Dunstan’s is also a congregation that sings. Although most of our hymns come from the Episcopal hymnal, we also delight in trying new kinds of music from many different sources. The organ at St. Dunstan’s was originally created by the Delaware Organ Company of Tonawanda, New York, in 1964. 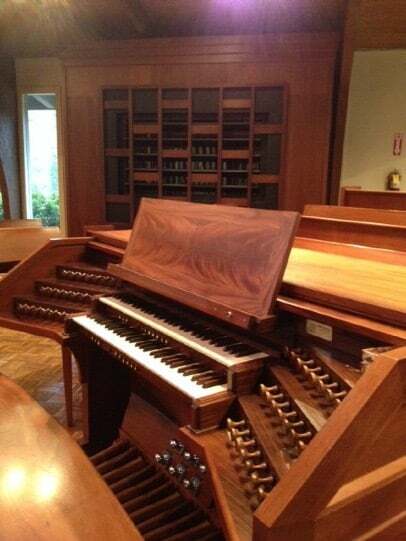 It was rebuilt and relocated to St. Dunstan’s in 1997, with tonal revisions, new case, and new console, by Phil Parkey and Associates of Atlanta, Georgia. The present instrument consists of two manual divisions and pedal, controlling 19 stops, 6 ranks, and a Zymbelstern of 8 bells. The grand piano is a Steinway, Model M, from 1939. 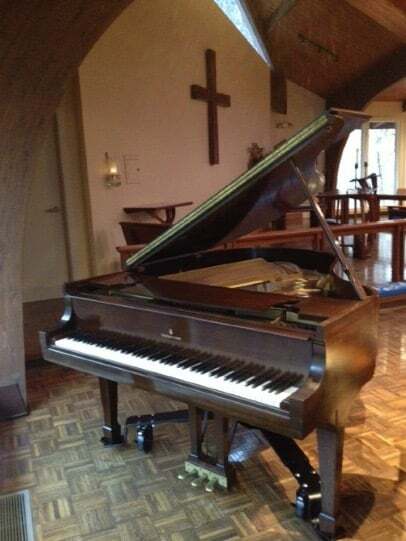 A recent gift from parishioner John Lloyd and his family, it has a full and warm tone, a beautiful mahogany finish, and original ivory keys. St. Dunstan’s harpsichord was a gift from former parishioner James Millikan. 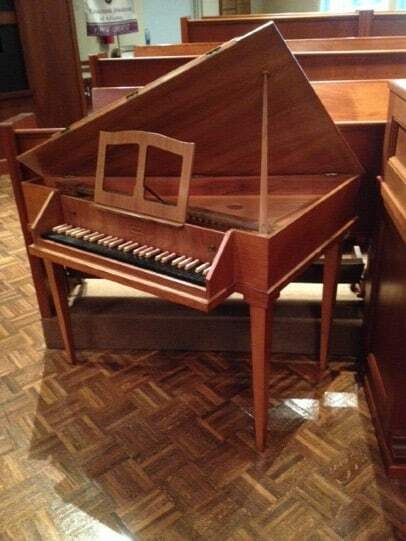 It is a beautiful “spinetta” made by Neupert, a well-known German harpsichord builder. The instrument was built sometime before 1950 and has been fully rebuilt and restored by Adam Decker, a prominent Atlanta harpsichord dealer. The principal focus for all of St. Dunstan’s musicians is to provide musical and liturgical leadership for Sunday morning worship. However, we offer special events that enrich the musical and liturgical life of the parish. In addition to Sunday morning worship, we offer special events throughout the year, including Advent Lessons and Carols, a Dixieland Jazz Eucharist, and Holy Week services. Our wonderful acoustics and intimate setting also make St. Dunstan’s a popular venue for outside musicians, including the Atlanta Chamber Players. Watch our announcements below and in the music special events news section for upcoming events.